Automate your download speed tests and measure the reliability of your Internet service provider, Wifi or mobile network. Use this information to trouble-shoot intermittent connection problems. This open-source Windows application tests your download speed on a set interval and logs the test results to a CSV text file. 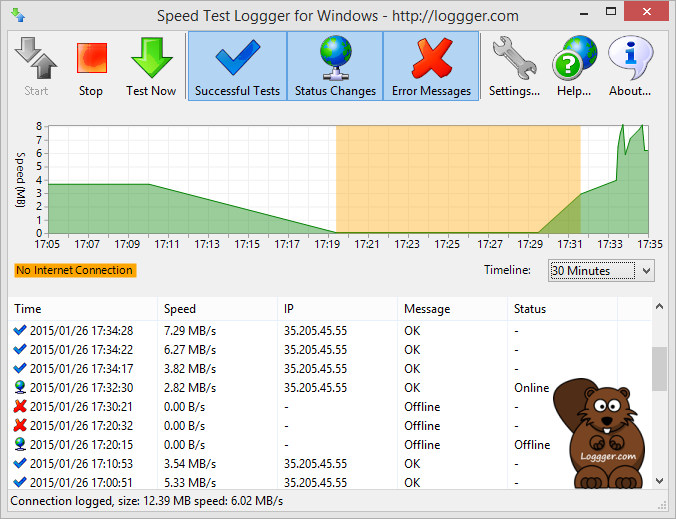 The logger also monitors service interruptions (PC offline/online) and IP address changes. Are you a software developer and want to improve the project? Get the full source code at GitHub. One idea could be to add upload and ping speed tests. © 2016 - 2018 Speed Test Loggger is a side project of the Kantu Web Automation Team. Try also our open-source Kantu Selenium IDE, the free Online OCR service and the Google Cloud Vision vs Microsoft Azure OCR software comparison wizard.